I realize it’s been a little while since I’ve posted. Sorry about that. Sometimes you just need a break from everything and I certainly took a break. There was so much food over the holidays that the idea of continuing to cook and eat and blog just wasn’t that appealing. I was sure no one minded until I received a comment from a loyal reader saying that her family was tired of eating Lean Cuisines and that I’d better come back soon. So I’m back from my hiatus, ready to go – albeit with the world’s easiest salad recipe. I know this won’t save anyone’s dinners anytime soon but it’s worth sharing and having in your repertoire for when you need it. This salad came from a now-closed little deli/restaurant/catering spot in Atlanta called Savor. When we would have committee meetings for work, they would deliver seriously tasty sandwiches and this salad for us. I miss that I could actually get my hands on a pretty authentic jambon de Paris sandwich there. Nothing is better than baguette smeared with unsalted butter, a few slices of ham and diced up cornichons. I guess now that I’ve typed that out, I don’t know why I haven’t made that at home yet. I think the husband would be pretty happy too. He still talks about his jambon sandwich from our Paris trip in October. 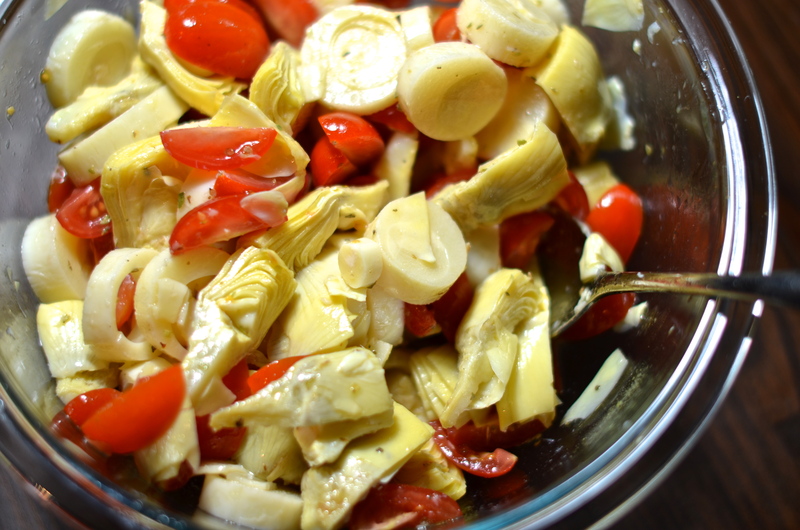 I encourage you to use both whole hearts of palm and whole artichokes. When you buy the “salad cut” hearts of palm, you sometimes get the woodier pieces that no one wants and quartered artichoke hearts are never as good as whole. They’re just not. That’s why they’re cheaper. Spend the extra dollar on both and take the additional 4 minutes to chop everything at home. 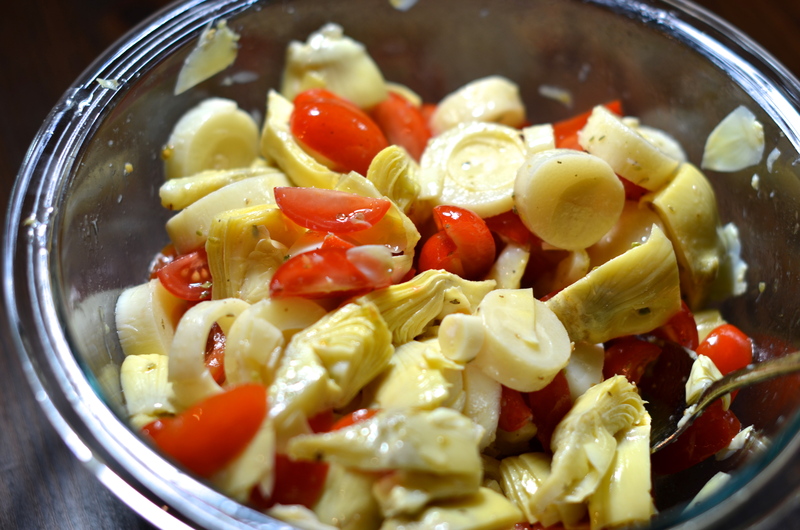 So, to make this salad, in a large bowl, add the sliced/chopped artichoke hearts, hearts of palm, tomatoes, oregano, salt, red wine vinegar and olive oil. Stir. Eat. The salad is tasty immediately and even better after a couple hours or the next day when all the flavors come together. Looking at the salad now, I bet it would be delicious on top of a seared piece of halibut or in a braised chicken dish. Now you can’t tell me I didn’t give you a dinner idea for tonight. 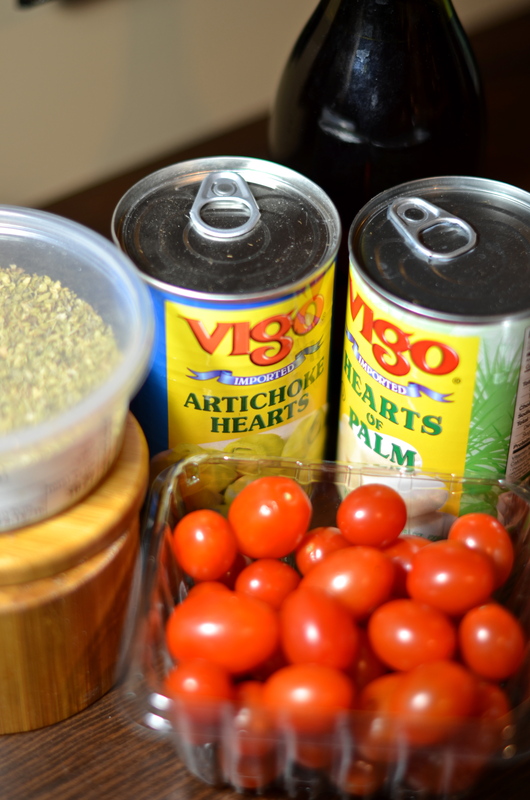 I have a few cans of artichoke hearts that I need to use and this is so fresh and simple sounding – I’m going to make it for my lunches this week! It’s really fresh and great in the dead of winter when canned things are about as good as it gets. Can be a little challenging to find good tomatoes, but those little grape ones are pretty non-offensive in the off-season anyway. Hope you like it! Making this to take to a friend’s tonight. Thanks for the memories! Yum! I know everyone will like it!